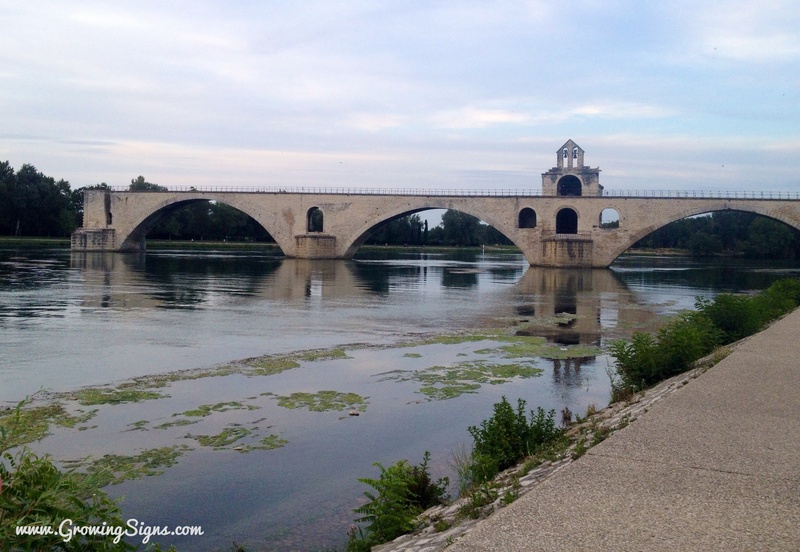 There’s a popular children’s song which mentions the town of Avignon, France, which was my family’s destination today. Do you remember the song? L’on y danse tous en rond. We all dance there, all around. 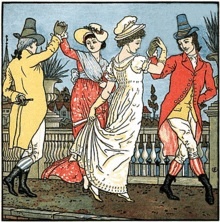 It’s sung in a round, naming all the people dancing -ladies, gentlemen, etc, and is similar to “Ring Around the Rosy” with everyone circling and falling. The bridge from the song was built in the middle of the 12th century –cue the incredible departure into history for my family! Leaving North America and traveling to France becomes an instant history lesson, since pretty much everywhere you look there’s bound to be something older than Canada. And as you can see from the photo, everything resembles famous paintings, or just plain looks like it should be in a painting. Avignon is in the gorgeous South of France, with an ancient walled city that famously housed 7 popes before becoming part of France during the French Revolution in 1731. Fast forward a little bit, and you’ll find my family arriving at the Avignon train station during an incredible one-day music festival –Fête de la Musique. 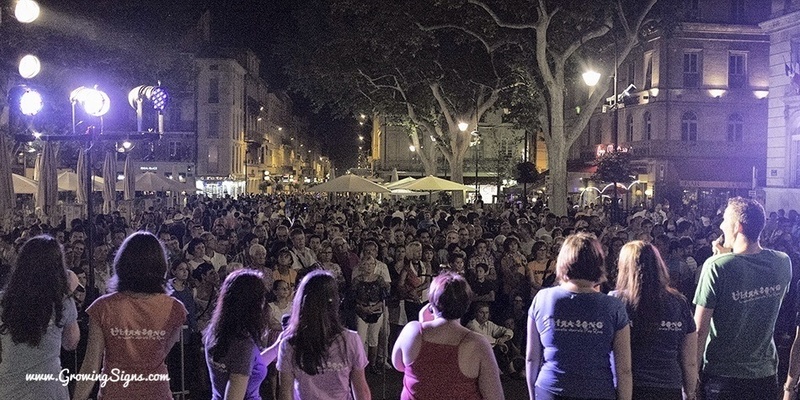 Our friends from Vancouver, who are now proud residents of Avignon, picked us up amid the flurry of thousands of other people visiting the city for the one-day free fête which celebrates any and all performers wanting to perform any type of music or song. Pure chaos, but in a good way. We enjoyed a glass of chilled rosé at their apartment before launching our still-jetlagged (and train-weary) bodies into the dizzying kaleidescope of thumping music and people in the cobblestone streets. We saw all sorts of musical performers, but most of all, we reunited our daughter with our friends’ daughters, two of her first best friends. It was an explosion of hugs, kisses, and jumpy jumps as they danced and circled around each other, just like the dancers of that famous song. Illustration from The Baby’s Bouquet, A Fresh Bunch of Rhymes and Tunes by Walter Crane (1878). By the end of our first day visiting Paris and after wandering around our hotel’s neighbourhood, I noticed 2 things: French people often make eye contact, look at one another and will hold their gaze on each other in passing, much longer than in North America. They are not shy about looking, and so, the people-watching is fantastic! I enjoyed taking in all the chic little outfits with the beautiful accessories passing me. Parisian women do not wear flip flops. Upon checking into the hotel, I had swiftly changed into my flip flops to go explore the area and find some lunch. I kept noticing people making eye contact with me while passing on the street, and then doing a double-take of my feet. Over and over again. I was perplexed as I watched them glance at my shoes with puzzled looks on their faces. Then it dawned on me that I hadn’t seen one single person wearing flip flops all day around our hotel’s non-touristy neighbourhood. Not once. Looks like I had already made my first fashion faux-pas in Paris! 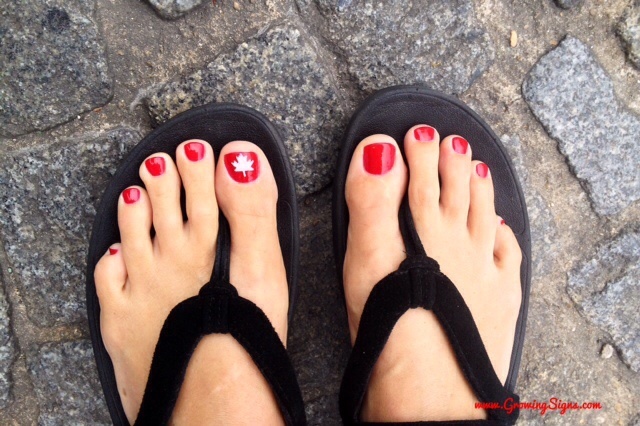 But then again, it could’ve been the maple leaf painted on my toe…? Thank you to Ricky at Bloom Essentials for the patriotic paint job. Off to the airport this morning, we are on our way! After planning this European holiday almost a year ago, and counting down the days for months on the calendar, it was finally time. My heart has been fluttering almost constantly for a week, and I’ve been jittery and light-headed for the past 3 days. Yesterday I walked into a pole, botched the laundry, and lost my house keys. But today? Today’s the day to fly to Paris! 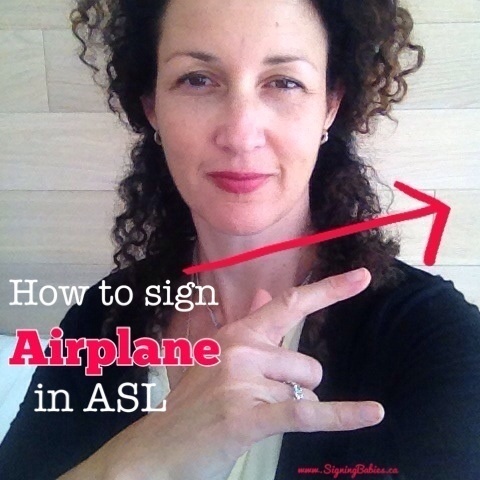 To sign AIRPLANE in American Sign Language, one hand takes off like an airplane up and across body with the pinky, index finger, and thumb extended while other 2 fingers are tucked in. 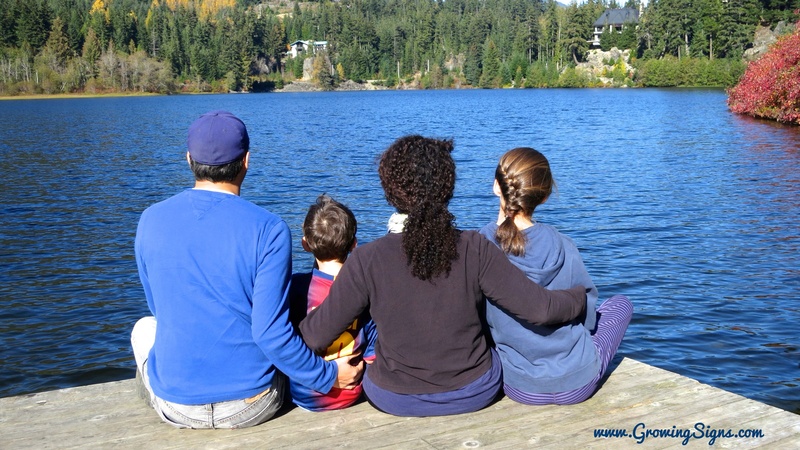 I’m looking forward to seeing what spending so much family time together really looks like. 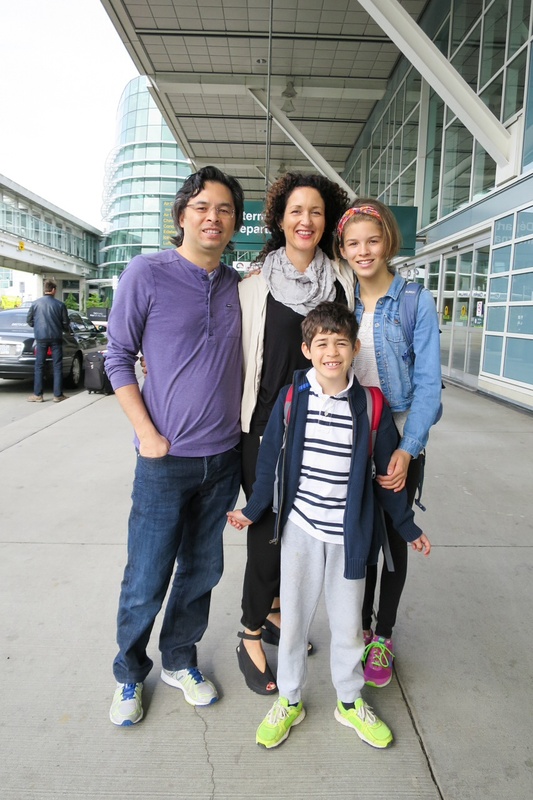 Next week we are heading to Europe with the kids for 6 weeks. Our very good friends moved to the south of France last summer for one year, and we promised to go visit them before they move back home. And we always hold good on our promises (especially when it involves France)! Well, now I’m fibbing. We’ve never taken the kids to Europe, but it’s time to take advantage of our friends’ invitation to come visit. So, in a week we will hop on a plane -me, my husband, Scott, our 12 year old daughter, Ella, and 8 year old son, Ian and begin what I know will be the trip of a lifetime. We’ll be gone for 6 weeks and will visit 5 cities in France and England: Paris, Avignon, Cannes, Oxford, and London. Luckily for me, my husband is a stellar trip planner -like out of this world. He gets all the credit for logistically putting this trip together (thanks, babe). He’s lined up some incredible accommodations for us to stay in: 2 big-city apartments, a beachside hotel, a quaint farmhouse, as well as our friends’ generous invitation to stay with them in their digs within the city walls of Avignon. And don’t forget about food! We’ve got reservations for world class food experiences in both countries- celebrity chef restaurants and Michelin stars are in our near future. And daily doses of pain au chocolat and gelato may be necessary. 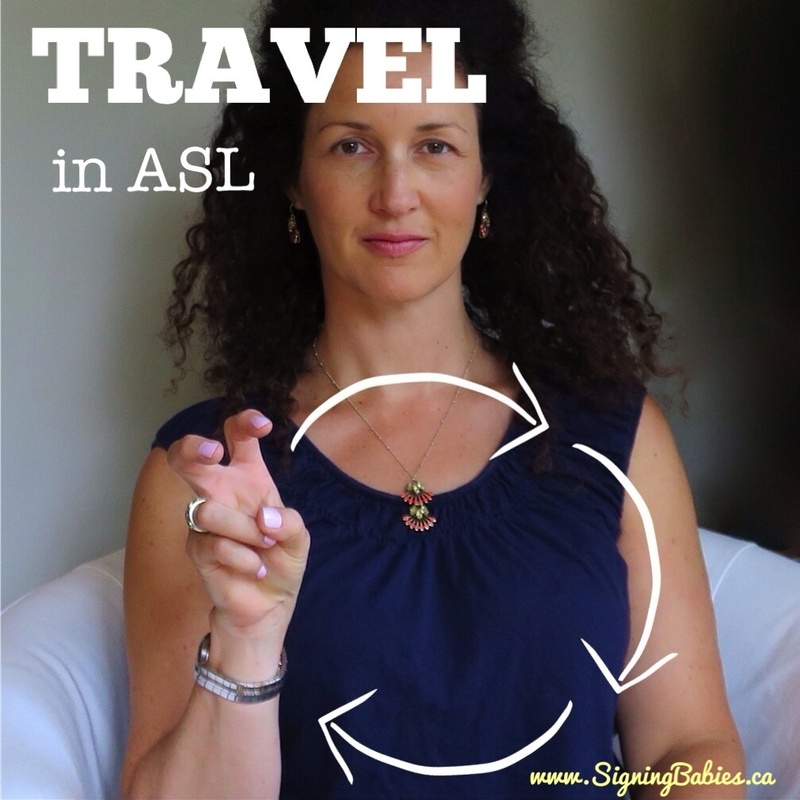 You can join the trip by signing up for my Growing Signs posts here (click the red box above right), and on Instagram & Facebook. 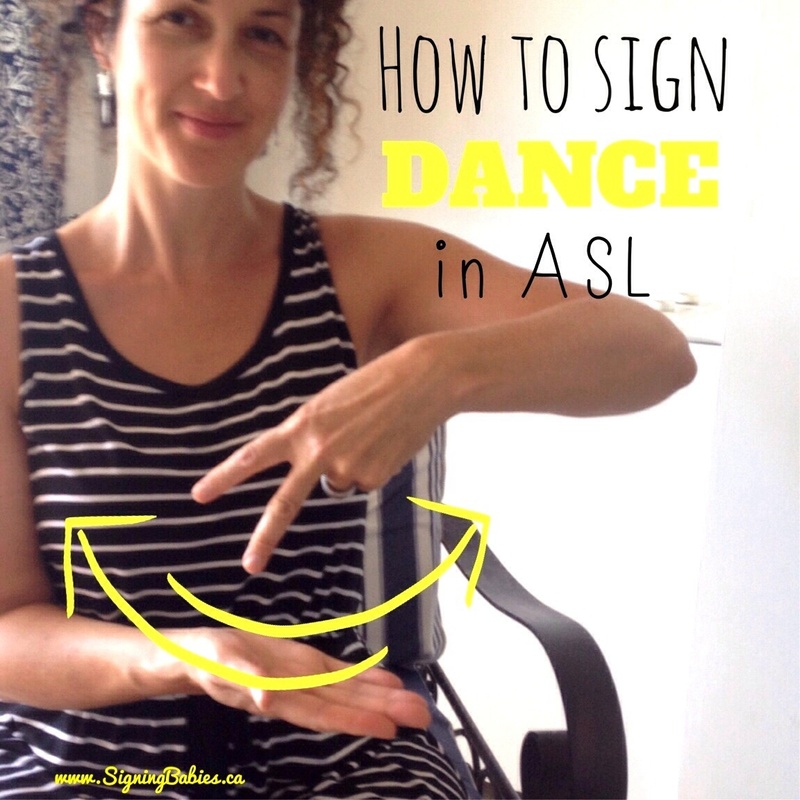 I get asked what the American Sign Language sign is for POTTY a lot in my baby sign language classes. Some parents are starting earlier rather than later, with their newborns and babies, like my mom-friend Lindsay Coulter, who writes the Queen of Green blog for the David Suzuki Foundation. Check out her son, Wyn, on the potty at 4 months old! The sign for POTTY should be added to the conversation whenever babies and kids use the TOILET or POTTY -it’s the same sign for both. 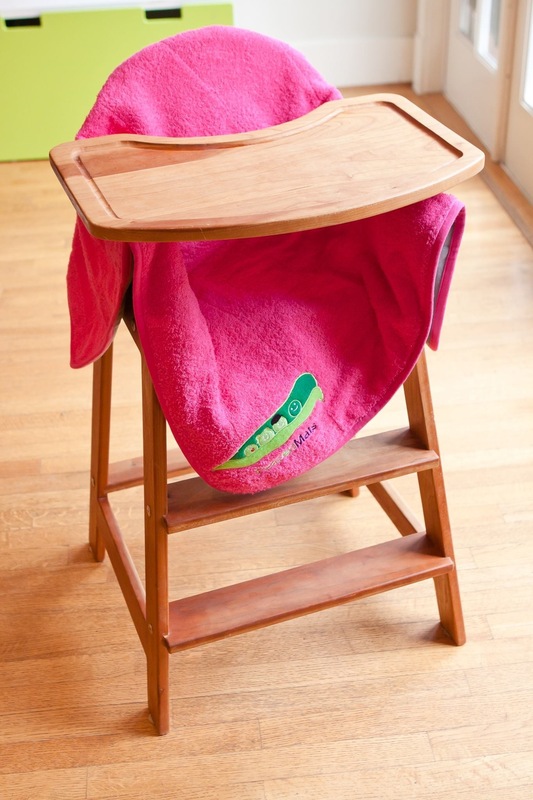 The visual cue (sign) as well as your spoken language (word) creates two opportunities for your kids to learn and follow your prompting about potty training. 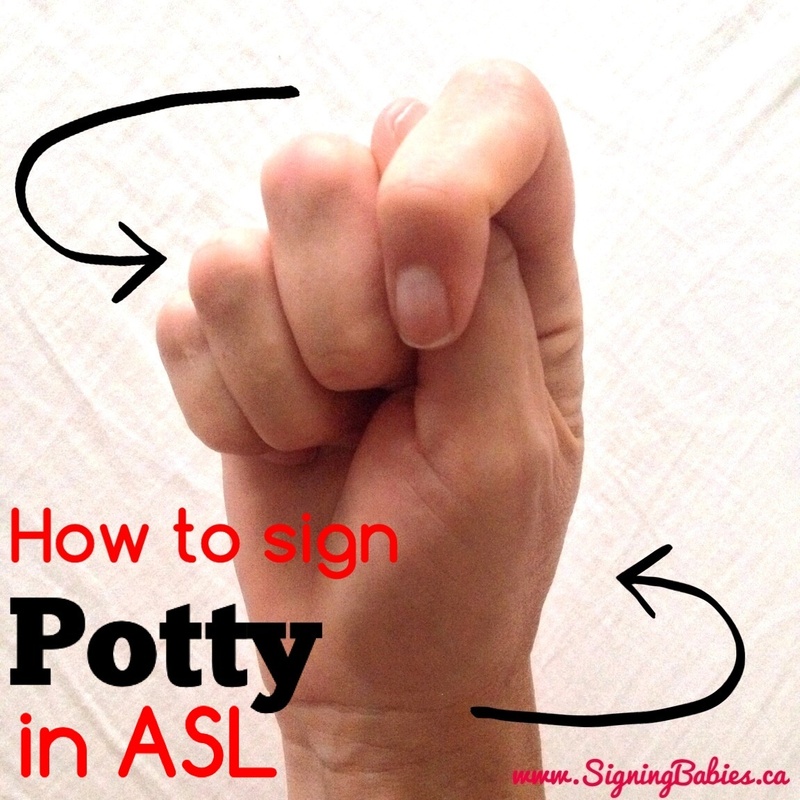 To sign POTTY, make a fist and tuck your thumb underneath your index finger, and then twist your whole hand at the wrist sideways few times. Newborns to toddlers, every child needs to be potty trained at some point. I trained both of my two kids at around age 2 1/2. One was easier than the other, but for both it took between 4-6 months until they were diaper free in the daytime. Potty training takes patience. Even once my daughter mastered daytime potty training, we went through many, many, many months of nighttime wetness. It seems that little bodies that know how to go to the bathroom during the day don’t necessarily wake up at night to go pee. 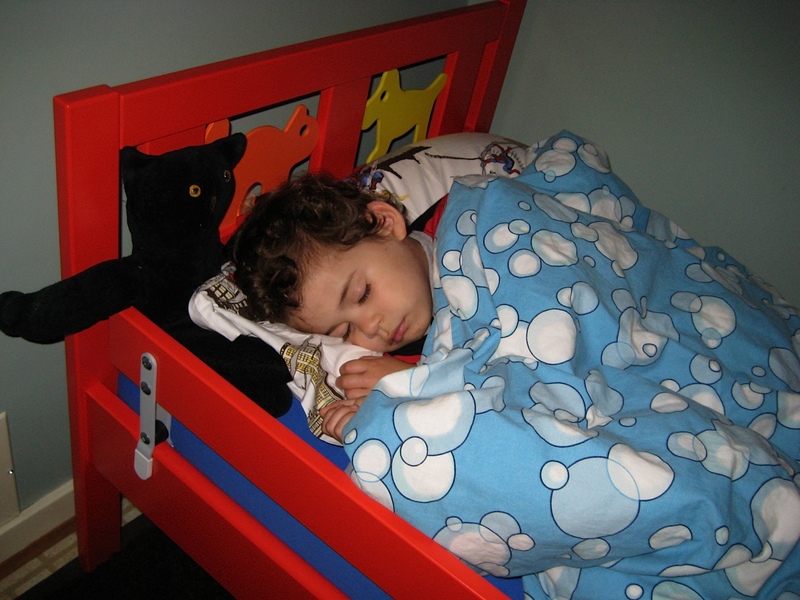 My son’s body had a long go of it, he was 7 years old before his body was automatically waking up to get himself to the bathroom. So for both kids I spent many nights washing sheets and remaking beds. While my naked toddler sat on the floor shivering. My history with nighttime potty training is looooong and wet. And I will admit, it made me quite cranky to change wet sheets in the dark while also trying to soothe my wimpering, shivering, cold child (and avoid the pee myself!). I thought I was so smart when I started double-making the bed: 1 plastic sheet + 1 fabric sheet + a 2nd plastic sheet + a 2nd fabric sheet. 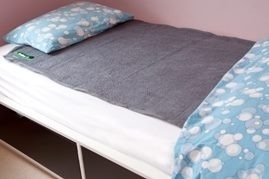 When I got the warbly call from their bedroom that they were wet, I’d pull off the top sheet and plastic sheet, get my kid redressed and back into bed, and throw the wet sheets in the laundry. Not bad, but my genius idea exhausted me; I still had a full set of sheets to wash in the morning, and then re-make the bed each day. Every day. And those plastic sheets were crinkly and made my kids sweat like crazy. I wish I had been as smart as my friends, Liz and Amanda! 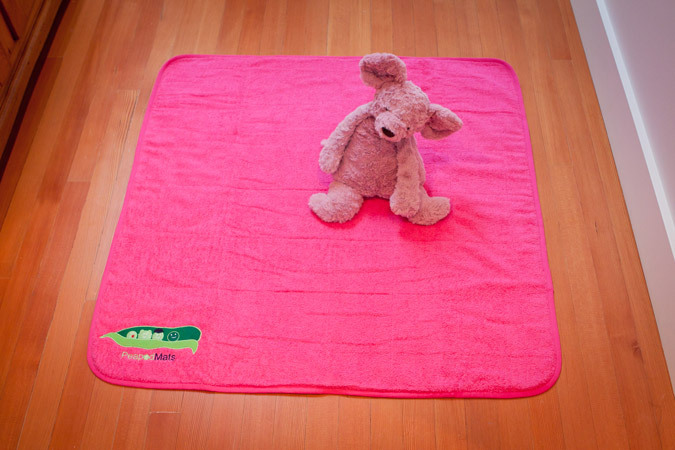 They’ve created a brilliant solution: PeapodMats -a soft, terry-cloth mat that doesn’t slip or leak and goes ON TOP OF your child’s sheets. It absorbs and locks in the wetness within its waterproof backing. Yes, that means all you have to do is pull off the mat and throw that in the wash. Your sheets and mattress stay dry. No wet sheets, no remaking the bed, only one thing to wash. Simple, soft, and effective. And it doesn’t take away the sensation of being wet on the top, so kids’ bodies still learn that they need to wake up. I love them for nighttime sleeping, and also for daytime playing, strolling, and sitting. 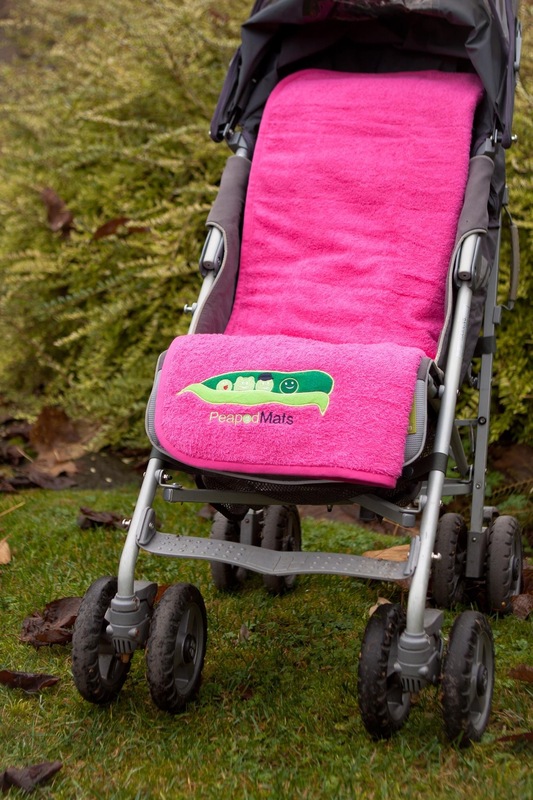 PeapodMats are eco-friendly, washable, waterproof and useful (which I know my friend Lindsay will love)! And Liz and Amanda have given me one to giveaway! Enter to WIN A PEAPODMAT of your own. Contest ends June 7th, 2014.